I tried out some of my new dies I bought this weekend. This is the QuicKutz gift bag die. it measure about 4.25 by 2.375 x 1. Great bag that you could decorate for any occasion to give a small gift or cash and gift cards. Next is the QuicKutz treat bag die. It is nice and big and measures about 4×6.125 inches. Make a bunch of treat bags for your next party of shower and fill them with fun goodies. Both of these dies are for sale in my ebay store the polka dot pine cone. This is the QuicKutz Berry container die, I used some burlap paper to make this and added some brads around the top for extra stability. It holds quite a few berries or any other treat of your choice. It is a 3 piece die set that has two different sizes of the label piece I used here which I cut out of chalkboard paper. 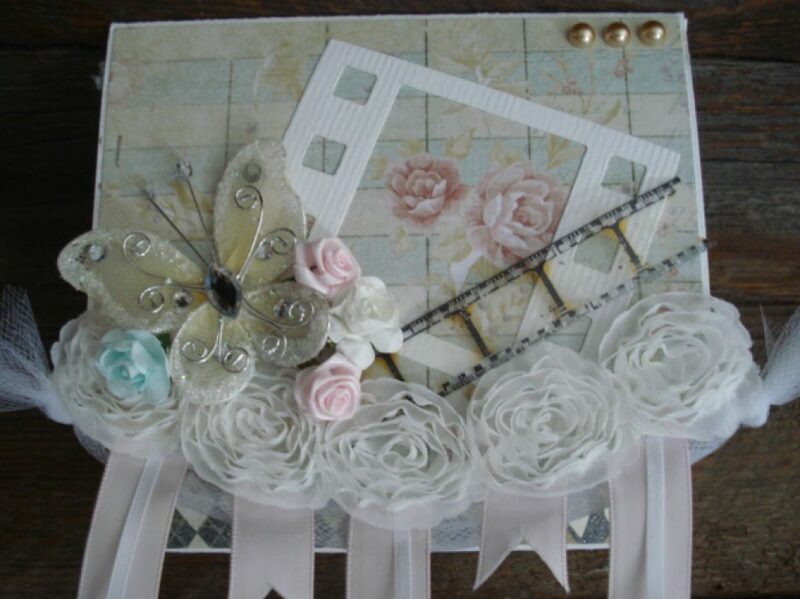 This is the layout I designed for last weeks scrapbook class. A paper pieced bunny head and an Easter Basket on some vellum paper with stitched butterflies. I cut the basket out of wood sheets from EK success using my Sizzix basket die. A simple card using the same flower die from Darice. This is a cute little flip page mini album I made for my scrap class I taught this week. I used some Vintage Bliss paper from Simple Stories. We also made this cute little fry box using the Fry box die from We R Memory Keepers. Also, here is my Pocket Letter for my friend for this month. If you haven’t heard about this new craze it is like having a pen pal except you add some creativity into it by designing a page with pretty designs and extras for your pocket pal along with the letter and maybe a little packet of Tea. Your base is a plastic page protector that is divided into nine pockets and you decorate each pocket with paper and embellishments. The pages are like what you would put trading cards in. It is very addictive, I love it, and I can’t wait to go to my mailbox and find something pretty in it. If you have any interest in it you can check it out at pocketletterpals.com. This is the pretty packaging I made for my letter and a bag of goodies for my pal.